Sometimes, showing is better than telling. When it comes to convincing students you have better deals than online retailers and the store down the street, that’s definitely the case. This month’s Marketing Plan is designed to make educating students on all that you have to offer both interactive and informal. By hosting this fun event throughout textbook rush, you’ll not only lighten the mood during a stressful time, but also have an easy opportunity to show students your prices aren’t so bad. Check it out! Will you host fun and games every day during the week of rush? Or make this a one-time extravaganza? It’s up to you! You’ll need lots of those! Ask your vendors for donations and look through old inventory for low-cost items you can give away without breaking your budget. What you’ll need: Three in-store items from varying price points, an empty shelf or poster board and 25 of our shelf hanger templates. How it works: This is a play off the Price is Right’s “Cliffhanger” game. Select your three in-store items. Ask your participant to guess the price of each item aloud. For every dollar they’re off, place a shelf hanger on your shelf or poster board. If they can guess the correct prices before all 25 shelf hangers are used, then they win! Award them with their choice of one of the items or an alternative bonus prize. How it works: Grab two participants to compete in this challenge. Show your participants the textbook and tell them its price on Amazon (or another online retailer). Then, ask them to guess the price at your store – which should be lower. Have each hold up their answer on our price tag template. The winner must be the closest to your price, within a $5 range. Keep going until someone gets it right! Make sure you announce the real cost of the book to the crowd and promote the fact that your prices beat Amazon’s. Use our Dare to Compare sign to make it easy to visualize. Then, award the winner with a designated prize; it could be an item, a coupon toward textbooks, or an entry toward a textbook scholarship for the semester! How it works: Determine the combined value of your items (ensure it’s over $100 to make the game more challenging.) Print the corresponding numbers you’ll need to build that value from our templates (i.e. if your value is 102.32, then print the 0,1,2 and 3 templates) along with the dollar sign, decimal sign and 3 OUT signs. Download them all here. Place all of the pieces of paper in a bag and hand it to your participant. They must pull one sheet at a time from the bag, arranging the numbers they select on the poster board in the order they think matches the total cost of the three items. If they pull all three OUT signs, before they correctly assemble the total value, then they’re disqualified. Give another participant a turn! The first to correctly arrange the numbers before pulling three OUTs wins either one of the items or a designated prize! What you’ll need: Three store items, three price tag templates. How it works: This challenge takes the classic Price is Right Game “Switch” to another level! You’ll simply select your three in-store items and place them on a shelf. The closer in price they are, the better. Enter the cost of each into one of our price tag templates and hang each sign on the shelf in front of an item. Make sure that at least 2 of the prices are switched. Then, show the three items to your participant. They have 30 seconds to decide whether the prices are with the correct items or if they should be switched. Award the winner with an item of your choice. 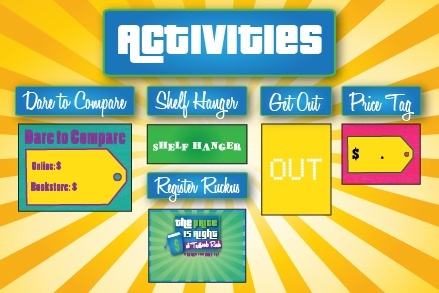 How it works: Allow students to compete in a timed shopping spree through the store, grabbing as many items as they can in the amount of time you’ve designated. Be sure to set limitations on which items can be selected; we suggest excluding textbooks and electronics. When they return (and not before! ), tell them that the challenge is actually to estimate the total cost of the items in their backpack – in three minutes or less! Once they submit their answer, have your staff tally up their totals and see how they compare to each participant’s response. The closest to the actual value of their backpack wins! Reward them with the contents they selected, a store gift card in the same amount as their backpack’s contents or an alternative prize. How it works: Source some extra inventory and place it in a bin near your registers. Once an hour, have your cashiers announce that the current customer is a winner! Make it loud so you grab everyone’s attention. Let them pick one item from your designated bin; after they’ve chosen, tell them if they guess the correct cost of the item, within a dollar, then they’ll get to take it home with them. If they guess incorrectly, give them a coupon for a future visit to thank them for playing. Just customize our template and you’re ready to go! How many rental titles does our store offer? 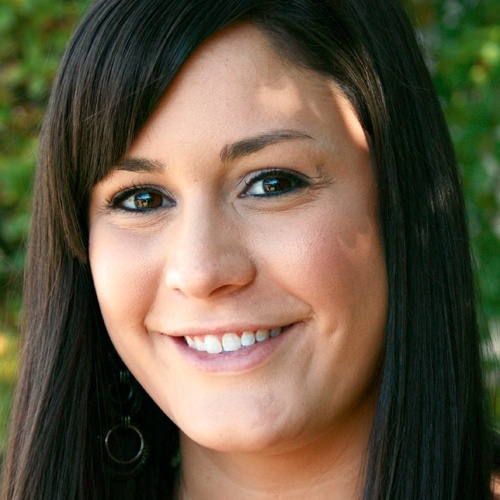 How much has our rental program saved students to date? What’s the average discount a student receives when buying a used book? Our highest-priced item in the store is a _______. What does it cost? Our lowest-priced item in the store is a _______. What does it cost? How many items are in the store? This will vary depending on how many activities you plan to offer, but we suggest having at least two staff members dedicated to the Price is Right portion of the event: one to act as an emcee, who announces rules, engages with the crowd, and keeps the excitement level high, and another to act as an assistant, handing out supplies and getting participants set up. We’ve noted what you’ll need for each activity above, so gather up the necessities and get them to your assigned staff members ahead of time to streamline the event. We’ve got you covered! 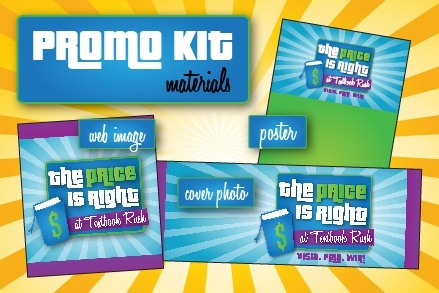 Simply use our promotional kit, which includes a customizable poster template, web image and Facebook Cover Photo to let students know about all the free swag and fun at rush this term! Be sure to hype the festivities continuously through social media as students will most likely be away on winter break up until the event. On the day of the event, be sure to dress up the store with bright colored balloons and/or signs, to give it the same atmosphere as the infamous game show. Then, start interacting with students and having some fun! Send out a survey at the end of rush to assess students’ perception of the event. What did they like? What do they think needs improvement? This feedback will help you fine tune future events and further enhance service all year long.